Air conditioners are complex systems where airflow, temperature, and pressure should work together to help the system work correctly. The fact that it is composed of several components suggests that it may fail in certain parts while operating. Broken A/C components can severely affect its operation until you notice that your home feels warmer even if the unit’s turned on. When your central air conditioning system is not cooling, be sure to check the following A/C components. Does it feel like there is not enough cool air coming from your air conditioner? If your A/C struggles to distribute conditioned air throughout the house, your air filters must be at fault. Check if the filters are clean. Make sure to keep it free from any blockages to allow a smooth airflow to provide your home with the desired temperature. To understand why your A/C’s not cooling, you need to know first how an A/C unit cools your home. The cooling process starts from the evaporator where the air is absorbed and then transferred to the outdoor unit. But with a filthy and unmaintained condenser unit, the heat will not disperse properly. Taking good care of the condenser means keeping the area around the unit clear of obstruction. Does your A/C blow out lukewarm air instead of cool air? A faulty thermostat is probably the cause of the issue. Spotting the problem on the thermostat can be difficult, but you can tell where the issue lies by bringing in professionals. The circuitry inside might have malfunctioned, or the batteries might have stopped working. 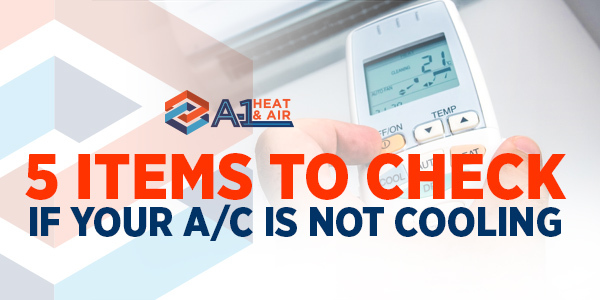 If the thermostat fails, your air conditioning unit will not work either. See a licensed HVAC professional to check your thermostat if the problem persists. A refrigerant leak or a low refrigerant charge is one of the reasons why your A/C unit is not cooling. Without enough refrigerant, your cooling unit will not absorb the right amount of heat to cool the air. If you notice a hissing or bubbling noise or ice buildup on the unit, it signals trouble on the refrigerant. Any moment your refrigerant may fail thus, be sure to keep your technicians number for emergency needs. Considered as the heart of an air conditioning unit, the compressor supplies the required heat through the indoor and outdoor unit. If it is not working, your air conditioning unit will not supply cool air in the entire house. A damaged compressor may require replacement. If your HVAC contractor can revive it with a complete repair, it would be less expensive. If your air conditioner is not cooling your house, schedule an inspection service at A-1 Heat and Air Conditioning as soon as possible. Our experts will help you identify the root of the issue and offer cost-effective and quick solutions. Call us today for an appointment.